In the previous post, we saw that the dramatic increase in patent awards since about 1980 has not been accompanied by any consequent change in overall economic growth in the United States. But before we conclude that patents don't do anything at all (except employ examiners and attorneys), let's look a bit farther afield. For convenience, we repeat below the diagram shown in the previous post, of annual patent grants for the last half-century plotted on a logarithmic scale. 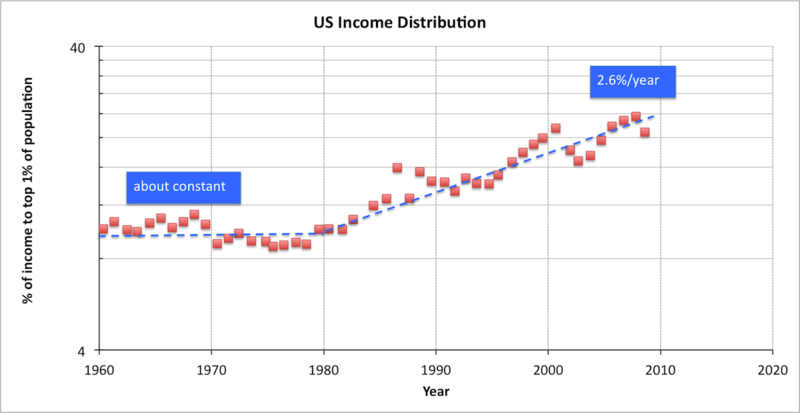 We can immediately see that, just like the number of patent grants, the share of income going to the top centile was about constant (or perhaps falling a bit) in the period 1960 to 1980, and then some time between 1980 and 1983 started going up dramatically. While there's a lot of scatter, we can make a plausible approximation that the share grows at about 2.6%/year from 1980 to 2010. This isn't exactly the same as the rate of growth of patent grants, but it isn't that different. Certainly the qualitative behavior of the two datasets is extremely similar. It's not easy to say if one is delayed with respect to the other, so the relationship might be causal, or it might be that both are the result of a single common cause. (Or, of course, the correlation could be accidental.) But in any case, this dataset looks a lot more like something related to patenting than the US GDP did. Now, folks who have studied these issues (such as Prof. Piketty) would point at changes in tax law and corporate culture long before looking at intellectual property issues, when searching for the reasons behind the increase in wealth concentration in recent decades. And quantitatively they are probably correct. If we value each patent granted at $50,000, then the total value of a year's patenting is around twelve billion dollars. Even if that's pessimistic by a factor of 3 or 4, it's still a rather tiny fraction of the US GDP of around fifteen trillion dollars today. It seems reasonable that we should regard the close resemblance of our two graphs as showing that the behavior of both datasets is driven by a common cause, which we might characterize as the increasing influence of established wealth in governmental policy over the last 3 decades. Nevertheless, we will suggest by the following argument that the result we see is consistent with a sensible understanding of what granting lots of patents might be expected to produce. A patent is a right to exclude: it gives the holder the legal right to prevent other people or organizations from doing something that, absent the patent, they have the ability and resources to accomplish. (You can't sue someone for infringement unless they are able to infringe.) About 90% of granted patents are owned by corporations, in the majority of cases due to compulsory assignment as a condition of employment. This percentage, incidentally, was only 71% in 1991. The possession of these rights would be expected to have two consequences. The first is that the relative value of an employee relative to an employer is reduced: the employer now owns something the employee knows how to do. The employee can make improvements on an invention, possibly for a different employer, and patent same - but if the practice is still covered by the first grant, the initial employer can exclude the inventor from their own invention. The second consequence is that established firms can raise barriers to entry by owning large numbers of patents. Barriers to entry increase profitability by reducing the number of competitors in a space without the need for product improvements. As noted, for example, by Boldrin and Levine in Against Intellectual Monopoly, patenting tends to increase as industries mature. Exclusion of competitors without corresponding improvements in products or services represents a net transfer of wealth to corporate management and investors over consumers. If patents were granted only for substantial improvements in products or services, and thus their disclosure represented a public good, it is possible that this transfer might be mitigated by the benefit to the public. However, US patents are in fact granted more or less at random, with little distinction between meaningless and profound disclosures. (We will discuss this assertion in more detail in the next post; a similar point is made in a recent post from the folks at Patent Progress: Why We Need Better Patent Quality.) It is unlikely that the resulting public benefit would outweigh the cost of granted rights to exclude. And, of course, the third consequence of granting rights to exclude is the rise of non-practicing entities, patent "trolls", whose activities involve no products at all, but simply the threat of exclusion of other parties as a means of extorting payment. 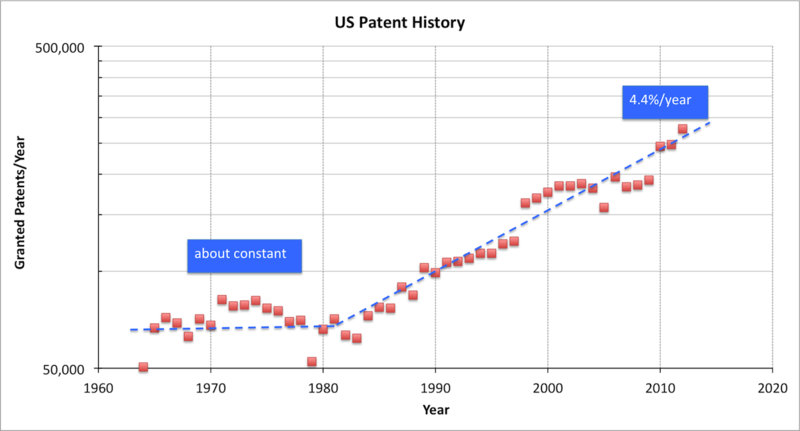 Thus, it is plausible, though hardly proven, that the increase in US patenting has played a role in the roughly contemporaneous increase in the concentration of wealth in the United States. Research work in the islands of the Aegean sea over 2300 years ago, reported in Will Durant's The Life of Greece , showed that a substantial middle class is required for the success of a democratic system of government. While many other changes in policy are needed to moderate and perhaps reverse the progress of the United States towards a plutocracy, improvements in the means of granting patent monopolies can play a role. Suggestions for such improvements - some modest, some wildly ambitious - will constitute the topics of the remainder of this series of posts. Notes: 1: OK, I'm doing this one from memory; my copy is buried in the garage, don't ask. If someone has a digitized version of the book and can provide the specific citation (and any corrections to my instant characterization) I'd appreciate the help.